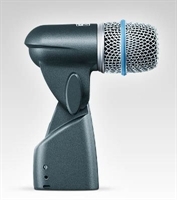 Beta 52A Instrument Microphone The Shure Beta 52®A is a high output dynamic microphone with a tailored frequency response designed specifically for kick drums and other bass instruments. Beta 56A Instrument Microphone The Shure Beta 56®A microphone has a frequency response specifically tailored for drums and instruments. 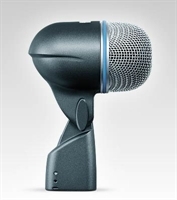 Beta 57A Instrument Microphone The Shure Beta 57A® is a high output supercardioid dynamic microphone designed for professional sound reinforcement and project studio recording. 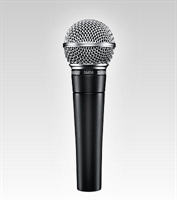 Beta 58A Vocal Microphone The Shure Beta 58A® is a high-output supercardioid dynamic vocal microphone designed for professional sound reinforcement and project studio recording. 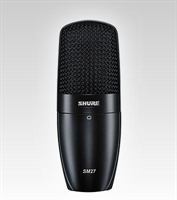 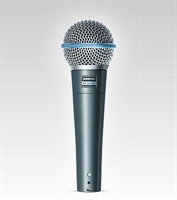 Beta 87A Vocal Microphone The Shure Beta 87A is a premium quality supercardioid hand-held electret condenser vocal microphone with exceptionally smooth frequency response and high sound pressure level capability. 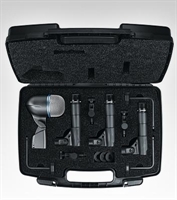 Drum Microphone Kit Drum Microphone Kit includes three SM57 mics, one BETA 52A mic, three A56D Drum Mounts, carrying case. 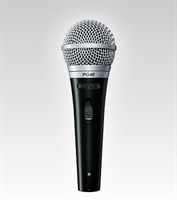 Vocal Microphone An excellent performance microphone for spoken word applications.